PLAY MOBILE, ONLINE, OR DOWNLOAD! Getting started at Paradise 8 is quick and easy. In fact when you follow the step-by-step guide below, you'll be playing the games you love within minutes. Get ready to dive into winnings with Paradise 8! Take all of your favourite slots and casino games with you, wherever you go! 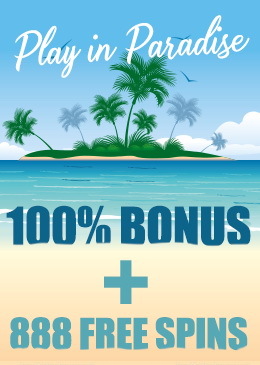 Paradise 8 offers a complete suite of nearly 100 mobile games that give you the chance to win real cash no matter where you are on the planet. Whether your game is blackjack, roulette or slots, they're all available online with no download required. Simply click the "Play Now" button below to launch the online casino lobby. Getting started is even easier than you think; it's as easy as 1-2-3! Downloading the free casino software allows you quicker access to new games, game updates and additional casino features. Click the Download button to begin your download. You may choose to save the file to your computer (recommended) or open it. The download will be complete in minutes! Sign up for a Real account and create your own unique Username. Go to the Cashier and make a deposit using one of our many deposit options. Depositing is easy, safe and secure. That's it! You are ready to enjoy our 180+ Games including the revolutionary i-Slot™!